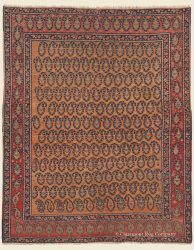 For centuries, the Afshar nomads were the preeminent Persian tribal group, populating numerous regions within their country’s borders. By the twentieth century, however, their ranks had been diminished to an area in the southeast corner of Iran. Although historians dispute their exact origins, they do agree that their Turkish dialect points to either Azerbaijan or East Turkey. 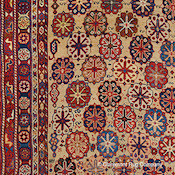 Another interesting fact is the striking similarity to antique rugs woven in the Caucasian village of Chajli in the Shirvan district (part of Russian Azerbaijan).Despite the decline of the tribe’s stature, antique Afshar carpets uphold their once great legacy. 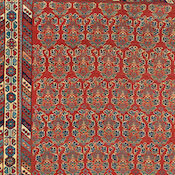 Nineteenth-century Afshar rugs and carpets are renown for their consistently high-quality of materials and craftsmanship, along with a unique aesthetic. 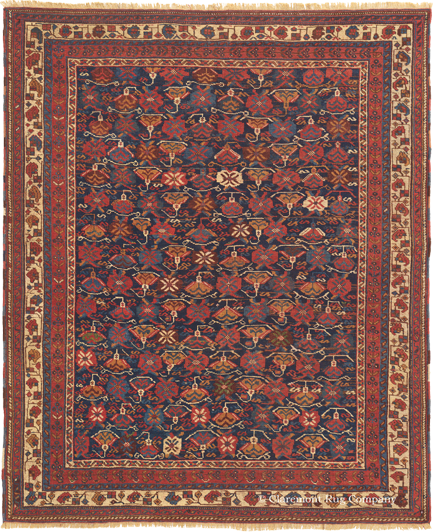 Three of their most prolific designs include simple diagonal rows of “boteh” (experts believe that Afshar weavers may have been the first to use “boteh” in carpet weaving), the classic “center and cornerpiece” antique carpet design, and a vertical axis of three stepped medallions. Their most intriguing design is the “Dragon and Phoenix”, a rarely seen, highly abstracted version of an ancient motif dating back over 5000 years to China. Other designs include the lattice or “Tulip” design, prayer rugs, “Tree of Life”, and rows of repeating shield medallions. 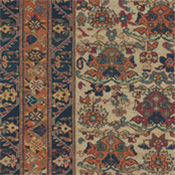 Most designs belie their heritage: Caucasian designs with a South Persian flare! 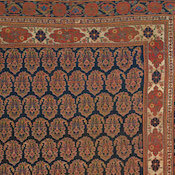 High-quality antique Afshar rugs display deeply saturated dyeing techniques, and they almost always sparkle from the lanolin-rich wool culled from their own flocks. 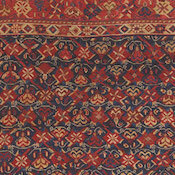 Typically, Afshar rugs were finished at either end with intricate flatweave and the sides with multi-colored selvedge. 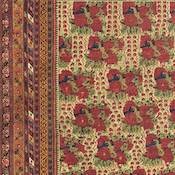 A majority of their weavings are found in area sizes between 3ft x 5ft and 4ft x 7ft; however, they also wove keleges (5ft x 10ft), small bags, flatweaves, and only occasionally larger roomsize carpets. 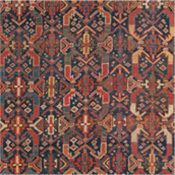 Like their venerable neighbors, the Qashqai tribe, antique Afshar rugs have become more and more scarce, and therefore more valuable. 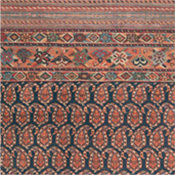 Many who collect the high-profile Qashqai and Caucasian rugs almost always include Afshars as well, making stunning floor pieces and excellent wall hangings.